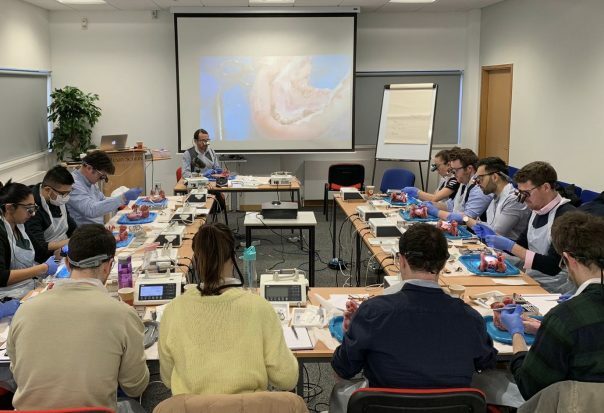 Dr Jose Zurdo (Carisbrooke Dental Practice) spent his weekend at the Henry Schein Teaching Facility, Glasgow, teaching a group of talented dentists advanced surgical skills to aid with periodontal soft tissue management. Drawing on his 16 years as a Periodontal Specialist, Dr Jose Zurdo covered topics such as flap design, crown lengthening, gingival grafting and soft tissue management for hard tissue grafting. The course has been incredibly successful, and whilst technically challenging, is in extreme demand from General Practitioners who are seeking to better support their own patients. Dr Jose Zurdo is planning on running another course soon in Leicestershire, and if you are interested, please get in touch to pre-reserve you place.